The elec­tric­i­ty pro­duc­ing im­ages and sculp­tures of Heike Kluss­mann & Bau Kunst Erfin­d­en were part of the ex­hi­bi­tion AM­A­TEURISM at the Hei­del­berg­er Kun­stverein, Ger­many. The work is based on the joint re­search pro­ject DYSCrete on dye-sen­si­tized so­lar cells and so­lar ac­tive con­crete. 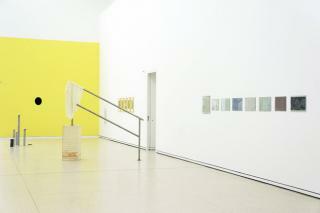 The Hei­del­berg­er Kun­stverein pre­sents AM­A­TEURISM an in­ter­na­tio­n­al group ex­hi­bi­tion with par­ti­ci­pa­tion of four­teen artists. The ex­hi­bi­tion ex­amines the pheno­menon of am­a­teurism in con­tem­po­rary art, in which artists go be­yond the boun­daries of ex­ist­ing cat­e­gories, dis­ci­p­lines, and in­sti­tu­tions, navi­gat­ed by their cu­rios­i­ty. Please take a look at Hei­del­berg­er Kun­stverein´s web­site for more in­for­ma­tion.